Does Amazon’s “Kindle” Signal The Death Of The Traveling Paperback? I work in the publishing industry, and I’m also an avid reader – so it’s no wonder I’ve been knee deep in Kindle speculation for the past few weeks. 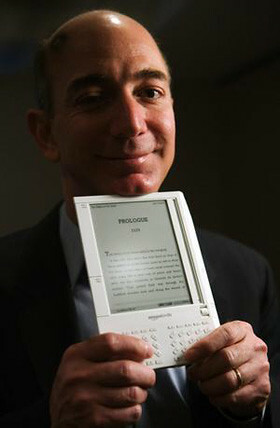 Kindle is Amazon’s new portable reading device; it’s smaller and lighter than a book and it holds over 200 titles. Other companies have launched similar, relatively unsuccessful products in the past but Kindle’s connection to bookselling giant Amazon is making people wonder whether this could be the device that actually redefines how we read. At work we’ve all been considering Kindle’s implications for publishing, but none of us can personally imagine this new gadget replacing the tactile delight of curling up in our favorite chairs with a good book. It’s not just that I’m fond of bound and printed pages as physical objects. I’m also partial to reading books in the bath, where I can only imagine dropping Kindle in the water would be a much more traumatic experience than dropping, say, The Devil Wears Prada. But it’s more than that; books are attached to my memories. When I look through my wooden bookcases, I remember where and when I read a particular book and a whole scene from my past rushes by in a photographic snap. I was thinking about this relationship to books and where Kindle might fit into my world when I found myself remembering the two years I spent backpacking around three continents. This was right before I took a 9-5 job and had to worry about things like the future of reading. As I was preparing for this trip, the biggest packing dilemma I faced was figuring out which book to stuff into an already overflowing backpack that was no bigger than the luggage most people take for a weekend jaunt in the countryside. In my own mind I was packing THE book, the only book I would be able to read in the coming months. Should I bring War and Peace? Or maybe Finnegans Wake? These were the only ones that might actually take me two years to finish. and be light enough so that I wouldn’t need to see a chiropractor for the rest of my life when I returned home. It was clear that War and Peace and Finnegans Wake were far too heavy (and I also had serious doubts that I would actually enjoy reading them) so I eventually settled on Gulliver’s Travels. It struck me as serious but enjoyable reading and definitely a fitting choice given the adventures I hoped to experience. Recalling the days I spent contemplating this decision made me think that maybe the mobile library of Kindle would have a place in my backpack – if I ever took off for an extended period of time again. But then I remembered my actual reading experiences abroad. On my third night in a hostel in Ireland someone asked me if I wanted to trade Gulliver’s Travels for a water-logged copy of The Hill Bachelors. Its pages were swollen and soft and it looked dark and mysterious which is exactly how I was feeling about Galway at that very moment. I had arrived alone and wet and had been wandering around the city for days now by myself. I was too unsure of my surroundings to either make friends or comfortably eat a meal alone. My initial excitement was starting to give way to loneliness, so I was relieved when this stranger approached the bottom bunk where I was pretending to read Swift (but really contemplating going back home to a familiar bed and existence). I needed to interact with someone. But trade? I tentatively handed over my book. It felt wrong to let a boy whose name I didn’t even know walk away with my story – with what I had come to think of as the definitive book that would accompany me during my journey through the world. But once I let go of it I felt liberated. After the trade we started chatting about where we were from and what we were doing in Ireland and a few hours later I was having dinner and drinks with him and his friends. That night I discovered that in the world of backpacking the static rules of ownership no longer applied. This was only the beginning of many suspensions of the realities I lived by back home. Texts were being traded at breakneck speed, moving from hand-to-dirty-hand as we devoured them on long bus rides through the Outback and cold nights in the Andes. Hostels, backpacker friendly tour offices, and even restaurants had revolving bookshelves where you were encouraged to leave one or two of your books in exchange for one of theirs. But this wasn’t where the real action was happening. It was all about book-swaps between travelers. Here trading provided an easy segue-way into conversations and friendships. 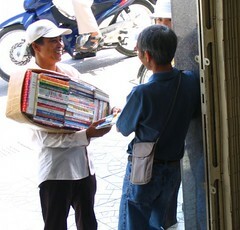 Books were a particular type of currency in the land of the transients – like a clean t-shirt or knowing which tour operators would rip you off. 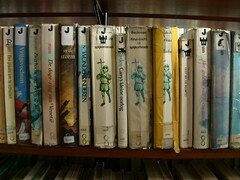 Books were judged not only on content, but also on weight and popularity. One Grisham title could get you two or three books in exchange in Australia, the same with Allende in South America. Michael Moore’s books were always floating around. Children’s books in Spanish were a hit in Argentina, where many of us struggled to learn the language. I once got stuck with a Judy Blume book for three weeks (don’t get my wrong, I’m a huge Superfudge fan) until I ran into a middle-aged German man who shouted “Yudi Blume, Yudi Blume” and thrust a worn copy of something in his native language at me. We backpackers created our own bestseller list and the competition was fierce. I read books I had always wanted to read and ones that I never knew existed. On my last day in Sydney, I traded The Lovely Bones for Not Without My Daughter. I opened my new used book’s first page. In it, someone had written “Auckland, New Zealand” and below that someone else had put “Milford, New Zealand.” The entries went on and on through New Zealand, Bali, and Australia, working their way down the first blank page and over onto the title page. The whole geographic history of the book was there. It was like the text itself had transformed into a traveler. Just then I couldn’t think of anything more depressing than putting it on a bookshelf and letting it sit there untouched year after year. I read the book on the plane to JFK. Before I handed to it off to a harried-looking young woman extricating her massive backpack from the conveyor belt, I scribbled “New York City” in it. And then I sent it off into the world feeling like I had left some piece of myself in its pages. Some part of me would travel to far-flung cities long after I was back in the routine of my settled life. I realized that while I was traveling the whole dynamic of reading had changed for me-the book now owned a piece of me and not the other way around. It was just one of many shifts in perspective. So even while Kindle provides easy (and light) access to a wealth of books – I would have missed out on a whole serendipitous experience which was, for me at least, a big part of the adventure. What do you think? Will digital reading eventually replace paper books? Share your thoughts in the comments! 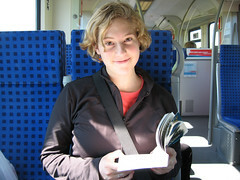 Rachel Friedman’s travel writing has been published in Get Lost Magazine, The Arizona Republic, and Clever Magazine. She works in publishing and is currently writing a book about backpacking-a kind of Motorcycle Diaries meets Devil Wears Prada-minus all the expensive clothes.